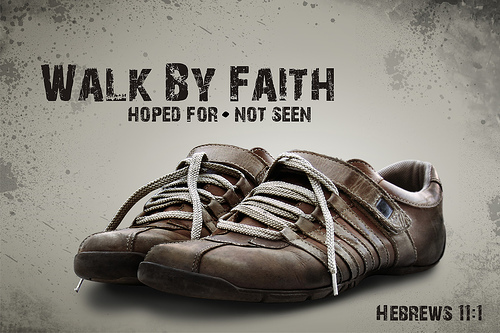 Heb 11: 1 Faith is a substance of things hoped for the evidence of things not seen. Now the Bible says, without faith it is impossible to please God .There is absolutely no way in the world that you can please God without faith.No matter how much you may have cleaned your act, you may have stopped smoking, chewing, drinking etc. You may have stopped thinking like the rest of the world, who is trying to live a good life, but is still far away from pleasing God…now youmay think that by living a clean life you can impress God! No, you cannot impress him in that way because there are people who live better lives by accident then we do on purpose. There are people who do not believe Jesus is Lord, but have more integrity, more commitment to their philosophy of life than many so called Christians. But our distinction as Christians should be spotless. We should live a sinless life, but that is not our distinction, it is more of a duty.Our distinction is that we believe in the shed blood of Jesus Christ. For the Bible says,“…for with the heart man believeth unto righteousness and with the mouth confession is made under salvation”. So believing God brings to you a state of righteousness. Abraham believed God and it was counted unto him as righteousness. So you cannot be a born-again-blood-washed Christian without faith!It is just not possible. Some of us walk like Christians, sing like Christians, talk like Christians, give like Christians but being disciplined does not make you a Christian. What, then, makes you a believing Christian? If you believe in Jesus Christ and accept him as your personal Saviour, you become a true Christian. Let us go deeper into the phenomenon of belief, because Biblesays,“Even demons believe…”, but they are not saved and they cannot be brought into righteousness. You need an action that validates your faith. Faith is not just a noun,it is also a verb.Many proclaim their faith on Jesus but when it comes from theory to practical,they do not apply it…this is where we fail to please God. We have faith when everything is going well but when the equilibrium of the life is disturbed we LOSE faith. Faith is not for proclamation only; we have to apply it in our actions, work on it! Here we see Jesus in Capernaum, which means village of Nahum (kha pher Nahum). Capernaum was the headquarters of Jesus’ ministry; He began his public ministry in Capernaum (Mat 4:12 onwards) it is the place where Jesus was received when he was thrown out of his own city, Nazareth. Capernaum is the village which was in the hands of Satan, a place where darkness prevailed.The Spirit of the Lord spoke to me about Capernaum specifically, because when I read Mathew Chapter 4, it stated that Capernaum was Jesus’ own city…now my question to God was why Nazareth and Bethlehem were not called His own cities? Please note that Jesus was born in Bethlehem and brought up in Nazareth but he dwelt in Capernaum (Mat4:13) Out of the 39 miracles done by Jesus 11 were in Capernaum, out of twelve disciples four of them were from Capernaum…why it was not done in Nazareth and Bethlehem which was more familiar to our Lord? The answer is simple …Jesus dwelt in Capernaum…The people there accepted him and were even ready to bearloss of their lives, to accept Jesus in their homes.They were ready to leave their profession for Christ; they were very radical in faith. Faith of centurion(Mat 8:5) he admitted that he was not worthy to accept Jesus in his house but he had faith in the Lord and in his word…he knew the power in the words of Jesus…so he pleaded to Jesus ‘only to speak the WORD…’. I want to deliver a message to Nazareth and Bethlehem, Christ may have born in you Bethlehem, Christ may have been brought up in you Nazareth, but if He is not dwelling in you…it is of no use. Now let me turn the same revelation to you, “Christ may have born in you in the past years and even brought up in your life but if he is not dwelling in you NOW, this life is in vain? If we are born in Christ,it is not we who live but it is Christ who lives in us. But sometimes due to unbelief and various reasons God does not find a suitable place in us to dwell. For instance, he did not find place to dwell in Nazareth, where he was brought up.Most of the people of Capernaum never knew Jesus before although some believed and accepted him…so Jesus found a place to dwell in Capernaum. We are the temple of God and the Spirit of God dwells in us. Does the spirit of God dwell in you? Now let us come to Mark Chapter 2,when it was heard that he was in the house many gathered together, so that there was no longer room to receive them…the presence of the Lord was so mighty in that place so that there was no room for darkness, for depression, for hatred and envy. If you have Jesus in your house there is no room for fear (John 20:19). The disciples shut the door from inside because of fear of Jews but when Jesus came and stood in the midst there was peace. Dear reader, are you in the midst of fear and doubt and have tightly shut the doors of your heart? Open those doors to receive the Prince of Peace Jesus in the midst of darkness and fear and He will render his peace unto you. 1) These four men had Faith; 2) They carried the burden; 3) They had unity among themselves 4) They were ready.There may be times when you are unable to find the way ahead, but your faith in God will find the way for you. Do not believe what you see, but see what you believe! We judge and believe things seen by our worldly eyes, but concentration things that our eyes cannot see. Our eyes will tell us – it is all over, it is finished, it is the end, no way forward! But through faith you will find a way – an open door! What was that machine called which divided the Red Sea in two? Was it the staff of Moses that did the miracle,or was it the East wind? Israelites were crying with fear when they saw the vast Red Sea; but God spoke to Moses and told him to stretch out his hand on the sea. This is what we do not do…we do not stretch out our faith towards the problem. Godwas trying to tell Moses,“Unless you stretch your hand, I will not divide the water. I will not command the East wind to blow the waters”. Work out on your faith and extend it further, keep it strong when everything is all right, but use it when it is really needed.Use it when all doors are closed;use it when you are suffering for being right; use it when people start saying all kinds of false accusations against you. What was it that helped those four men to find the way to Jesus? It was their faith on Jesus and their commitment to their ministry – carrying the burdens of others. If we were the friends of that paralytic man, seeing the crowd we might have concluded the story saying God has closed the door. After all the normal approach to the Lord was blocked, we might have said it wasnotGod’s time. My dear brother or sister, if you have faith you cannot imagine how many closed doors will open in your life, among your family and friends. Yes, normal approach was closed for them; there was no way to get the person on the mat inside the room. Yes, people were swarming inside but seeing all the circumstances, they were not discouraged and found a way among the closed doors. It is not your strength that will open the door, but the Faith in you will find the way – IN or OUT depending upon the situation. Without any conditions, PUT YOUR FAITH ON GOD!